The more I listened to Lis Addison's The Grace of the Green Leaf, the more I couldn't decide what I was more impressed with - her wonderfully sensual vocals or her amazing talent on beats and keyboards. This is, simply, a killer album, and if you ever needed a CD to play to get your blood pumping, your heart racing, or your feet moving, this one is it! The only apt comparison I can make, as far as the energy emanating from this recording, is to the vibrant releases from Gabrielle Roth and the Mirrors, which if you know anything at all, you will recognize is a supreme compliment. 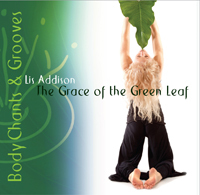 Whereas her previous album, The Song of the Tree, (which I also roundly praised), featured chants for a person's chakras, The Grace of the Green Leaf features "body chants" (BoCHa!) centers on invigorating the body's energy centers, acting as "focal points for meditation, healing, and ecstatic dance." I think it's the last of those three activities that best captures the CD’s true spirit. The tracks on this album are literally bursting with positive energy and vivacious vibrancy, so that any meditation one might to do while accompanied by it would be filled with visions of running on sun-dappled beaches or parasailing over tropical sky-blue waters. This is joyous music, people! Now, before you instrumental-only types get your undies in a bundle over this being a vocal recording or you start worrying that this is your "typical" chant album, trust ole Billy Boy on this - it's not. First of all, the chants are not the usual Kirtan or Sanskrit phrases but instead are repeated vocal wordless refrains that Addison has created which, well, sound really cool! The liner notes explain it better than I can, but between the actual vocalizations she makes and her wonderful singing voice (oh my, it is so wonderful to listen to), you've never heard chant like this! And I haven't even mentioned how good the music is or how infectious the beats are. What blows me away the most is how each chant is so different. The opening Kunda Hey brims over with pulsing freneticism - Addison's voice itself even has a breathy urgency to it, as the rhythms and swirling keyboard drive the song's energy to the boiling point.New Nation, on the other hand, which features the repeated vocal "NeNeWo," has a pop-ish effervescence and good naturedness to go along with its chill-out tempo and hand-clapping rhythm track. The vibe-like keyboard bridge is tres cool, as well, and those hand claps just make me wanna get up and cut a rug! My Big Community (vocal refrain "MaBaBwa") has a strong tropical/ethnic/rainforest-jungle-ish feel to it, with sampled guitar and bouncy beats. You can almost imagine yourself dancing around a beachside firepit! Four more tracks exist on this superlative album and each one will transport you somewhere new. Addison's musicianship on her assorted keyboards, loops, keyboard bass, etc. is a marvel to hear (she is joined, by the way, on djembe and dun dun by Bruce Randolph, although track info is not specified). As I noted above, I don't know what holds me transfixed more, her singing or her other musical talents. Man, if you can resist the siren-song of Cooing Doves and her refrain of "CooEeeOo", well, you’re stronger of will than I am! By the time one gets to the concluding Sensory Skin ("Coour" is the vocal), which is meant as a chant for the skin, described as "the largest sensory organ on our bodies, "if you're not "feelin' it," I suggest you check your pulse. The Grace of the Green Leaf is a realization of the ultimate merging of melody, voice, and rhythm, all three elements playing an equal role in elevating the human spirit beyond the drudgery and despair of daily life to a place of joyous movement and awareness of our bodies as an instrument of inner beauty and innate sensuality, celebrating our humanity at the very core of our beings. It's, indeed, great to be alive, isn't it?